Casinos are much like their real word namesake - players can bet and gamble Credits within them. A popular spin-off game is the Rare Grabber, and many still exist within casinos. A basic Casino game is called '13'. To play, the user pays the dealer for that booth. The dealer then rolls 2 dice and the better chooses whether to 'stick' or 'hit' (stick meaning stop at that amount and hit meaning roll another die). With this in mind, we'll take the example the dice read 3, 4 and 1, this would make 8 and the better repeats the process and asks to stick or hit. After the better has stuck, the dealer then takes their turn. If the dealer gets a better score than the better then the dealer will win. The dealer doesn't need to have a go if the better busted on his turn. Sometimes when betting the dealer plays for 't=r' meaning tie=redo. Self explanatory you repeat what you've already done as you got the same amount (some dealers say that if it's a tie then they (the dealer) wins). Overall, the dealer always has the advantage with rolling last. This game is very similar to BlackJack or 21 played in real life. There has been a lot of controversy over the future of Casinos on Habbo. Recently, many Casino owners ended up with permanent Bans on their account for the promotion of gambling (this was probably due to the Singaporean hotel being against Casinos and gambling in general). They were unbanned afterwards but the name of 'Casinos' are no longer the same. Most Casinos are now called Arcades to reduce the chances of being banned. 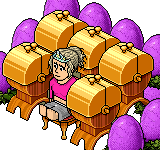 On August 2nd 2012, Habbo.dk's Sulake Staff members were ordered to disable all forms of dice (Holodice and Dicemasters) in the hotel and the Wheel of Fortune. This was due to the gaming authority "SKAT" claiming that gambling in Habbo was illegal. All Casino owners were permanently banned from the hotel and the restriction on gambling has not been lifted. This caused a massive decrease in the number of users (as well as the mute earlier in the year) and left many wondering what would happen to Habbo.dk in the future. On the 18th February 2014, codes were found that suggested that a Dice limit would be enforced in player's rooms on Habbo. Depending on how many Dice could be used in a room determined the future for betting, Casinos and general pay to play/pay to stay games. When this came about, players had to wait just under 2 months to find out what the Dice limit was - which caused uproar immediately. The Gambling Ban was officially enforced on the 7th April 2014, after Habbo published an article informing players of their change for how games were played on Client. The article didn't just stop at Dice type objects, but all random chance objects including Color Wheels, Magic Crystal Balls and Wheel of Fortunes. As Habbo didn't want to ruin the Casino industry altogether, they allowed Casino rooms to be used as a theme, but placing bets by outcome of a random element would be. This page was last edited on 7 September 2016, at 14:01.